Founded in 1968, Christian Students is a registered UCLA student organization and composed of believers in Christ from diverse backgrounds. We, at Christian Students, love our dear Lord Jesus and hold the Christian faith which is common to all believers. 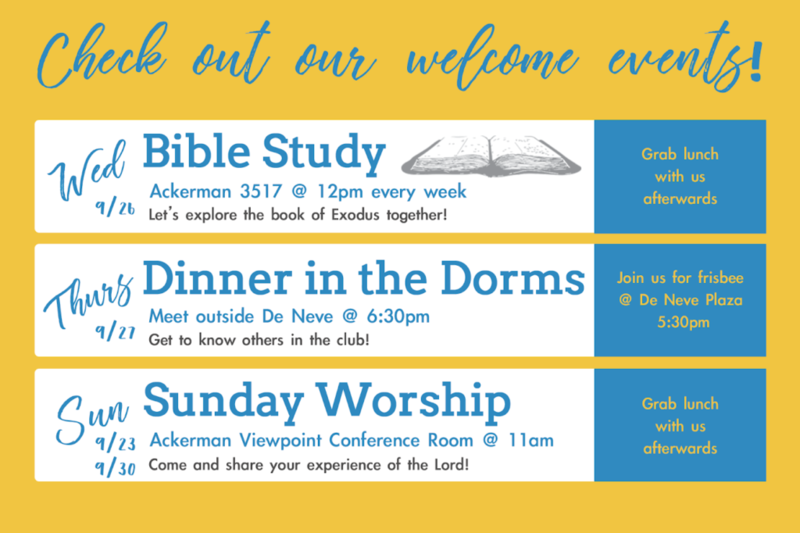 We offer weekly Bible studies on campus, smaller fellowship times together throughout the week, and on Friday nights we join nearby families for dinner and fellowship. During the fall and spring quarters, we join other college students from Southern California for a weekend retreat that helps refresh us and refocus us on Christ. We’ve found that loving and following Christ makes all the difference, so our hope is that together we can “pursue righteousness, faith, love, peace with those who call on the Lord out of a pure heart” (2 Timothy 2:22). If you’re looking for Christian fellowship we would love to have the opportunity of meeting you! God is uniquely one, yet triune—the Father, the Son, and the Spirit (1 Tim. 2:5a; Matt. 28:19). Christ ascended to the right hand of God to be Lord of all (Acts 1:9, 2:33, 36). Whenever anyone repents to God and believes in the Lord Jesus Christ, he is regenerated (born again) and becomes a living member of the Body of Christ (Acts 20:21; John 3:3; Eph. 1:22-23; Rom. 12:5).